Beijing, China -- The Chinese authorities, that is the Communist Party of China (CPC), must realistically admit that its minorities especially the Tibetans, Uighurs and Mongolians are flesh and blood people. Many of the country’s minorities have either disappeared or are too small in number to demand their identity. That, however, is not the case at least for the Muslim Uighurs of Xinjiang (East Turkistan) and Tibet. The Uighurs, who are of Turkish origin, were settled in these areas centuries before the Han Chinese conquered them. They enjoy empathy if not open support in Turkey and the neighbouring Central Asian Republics (CARs) like Kazakhstan and Uzbekistan. But China’s rise has bulldozed these countries into submission, especially the oil rich and land locked countries of the CARs. Uighur struggles, however, are beginning to get some recognition internationally. The Tibet issue is different and in some ways, unique. The Tibetans are a deeply religious lamastic society. Their recognition came not from the Han Chinese but the Mongols. The name “Dalai Lama” (Ocean of wisdom) comes from the Mongol Khan dynasty. The Chinese emperors came much later. Tibet was independent for most of history. When the Chinese People’s Liberation Army (PLA) invaded Tibet in 1950-51, history was forced to change. Eventually, the 14th Dalai Lama accepted the position adopted by Beijing. He renounced independence of Tibet but asked for genuine autonomy. The international community has taken a similar stand. What both the Dalai Lama and the international community demand are respect for the human rights of the Tibetans, security of their language, culture and heritage, and administration of Tibet Autonomous Region (TAR) by Tibetans, within the constitution of the People’s Republic of China. Basically, the demand is very simple. That Beijing implement its own laws and rules in TAR. Autonomy for major minority areas is a law of China. Freedom to practise religion is in the statute books. The Chinese authorities pride themselves on these laws. Yet, there is no freedom of religion in Tibet. 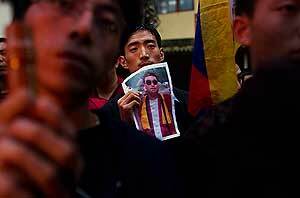 Possession of a photograph of the Dalai Lama is a crime. And where is autonomy? In fact, autonomous regions like Tibet, Xinjiang and Inner Mongolia are much more policed than any other administrative region in China. Minorities hardly ever rise in the hierarchy. To start with, they are suspect. The Chinese authorities are correct when they claim development has been brought to Tibet. But who are the beneficiaries? Not the Tibetans but the Han Chinese who have been brought in. This is also a cause of resentment among the Tibetans. But the authorities do not want to admit it, nor do they want to correct themselves. When Chinese NGOs point this out they are black listed and banned. Why? Another problematic policy is ethnic engineering in autonomous regions. With the excuse of educating minority youth better and provide them suitable employment, they are being dispersed across the country and replaced by Hans. Today, Han Chinese are getting to be a majority in capitals and important centers in autonomous regions. Where do minorities like the Tibetans stand? They are always suspect, as is the Dalai Lama. The Chinese authorities have suspended talks with Dalai Lama’s emissaries. This signalled a much harder position on Tibet. The Dalai Lama gave up all his political responsibilities and the Tibetan government in exile is now headed by Harvard educated Lobsang Sangey, a lay man. The Chinese authorities suspect every move from the Dalai Lama and his set-up. The Chinese authorities were taken aback by self-immolation by Tibetan monks, nuns and even lay people since February, 2012, protesting against Chinese occupation of Tibet and demanding the return of the Dalai Lama. On a count, 99 have committed self immolation at the time of writing this article, and there are no signs that this will abate soon. The authorities have failed to stop these self-immolations simply because they are not part of an organized affair. The Dalai Lama has also declined to interfere, despite Chinese exhortations. In a desperate attempt, the Chinese authorities have launched a propaganda that all those who have immolated themselves had their own personal problems, mostly shameful and of personal frustrations. Some pro-government Tibetan monks were made to declare that suicide was against Buddhist religious tenets. It made no difference, and the Chinese authorities have failed to explain why these self immolators shout anti-Chinese slogans and pray for the Dalai Lama. What is interesting is that these self-immolations are not taking place in Lhasa or the TAR. They are taking place in Tibetan areas outside the TAR in Qinghai and Sichuan provinces, parts of which the Tibetans want included in TAR. This, of course, is not acceptable to Beijing. Conceding this would give way to new questions on Chinese claim on historical sovereignty over Tibet. At the moment, China is in a catch-22 situation on Tibet and the entire Tibetan issue. With its economy, military strength and growing influence, China is a member at the highest table in the world. It has to behave with a certain amount of responsibility. These self-immolations are not only a diplomatic embarrassment for China, but internally too people’s ideas on the Tibet issue may be changing. Many Han Chinese are resorting to Buddhism, and some of them have met the Dalai Lama. According to Chinese official media report (People’s Daily, Feb 11), an estimated 80,000 people went to the Yonghe Buddhist temple in Beijing to burn incense and pray on ‘Chinese’ new year’s day. For most Han Chinese, Tibet is a distant, harsh place and alien to the Han way of life. The government has to give special incentives to Han Chinese to serve in TAR. This is hardly a situation that defends Chinese policy on Tibet. Where is China going to take their war against the Dalai Lama? Their recent propaganda says that the Dalai Lama was running an anti-China training establishment in India and these people were sneaking into China to encourage Tibetans to commit self-immolation. This propaganda has very deep and serious implications for India-China bilateral relations. The accusation comes from an official Chinese propaganda outlet and indirectly accuses India of collaborating with the Dalai Lama to sabotage China’s territorial integrity and sovereignty. Of course, China has not yet taken up the issue with India officially. But the issue has been recorded, allegedly as confessions from two Tibetans who had gone there from Dharamsala recently. The accusation is in the diplomatic brief case, to be taken out as and when necessary. What would be the next step? China has already pressured Nepal to arrest Tibetan refugees fleeing to India (Dharamsala) and return them to China. But India as a signatory to the UN Refugee convention cannot turn away refugees. In fact, India hosts the largest number of political refugees in the world, from a vast array of countries. This is a humanitarian issue. The Dalai Lama and the Tibetan diaspora in India remains China’s target. At one time, the Dalai Lama was described by the Chinese as the “serpent’s head” which must be crushed. The Dalai Lama’s security had to be enhanced. The Dalai Lama has made every effort to cooperate with the Chinese. This includes the recognition of Ugyen Thinley Dorjee (UTD), one of the two major claimants as the 17th Karmapa, whose monastery is in Sikkim. The 16th Gyalva Karma came from Tibet to India and established the Karma-Kargyu seat at the Rumtek monastery in Sikkim. After his death the regents of the ministry quarrelled among themselves to find their own 17th Karmapa. Tai Situ Rimpoche (TSR), one of the regents who has close relations with the Chinese, discovered UTD. Another regent Samar Rimpoche, discovered his own 17th Karmpa in Thaye Thinley Dorjee (TTD) also in Tibet. Hence, the seat of the Karmapa is in contest. The Dalai Lama recognized UTD as the reincarnation of the 16th Karmapa on the advice of TSR when he was in Rio de Janeiro to attend the Earth Summit in 1992. UTD came to India in December, 2000. The story was he escaped from Chinese security and travelled for four nights and five days to come to India without the Chinese realizing he had escaped. It is highly inconceivable that UTD could escape from Chinese security without being discovered for such a long time. The Chinese official news agency, the Xinhua, reported his escape only after he crossed over to India. Another mystery, indeed! UTD is a young man now and has studied religion under the Dalai Lama. But it is interesting to note that the Chinese authorities have never ever criticized UTD. And he, in turn, reciprocated the Chinese good will. This raises serious questions about India’s security, especially because Chinese officials have expressed concerns about UTD’s security. Available evidence suggests communication exists between UTD and the Chinese authorities. This reportedly takes place through emissaries, and verbally. The argument that UTD came to India at a young age and whatever Chinese indoctrination he may have received could not last this long, does not wash. Streams of Chinese come to see him. A trend, very clandestinely and cautiously growing over the last decade indicates an eventual Chinese controlled Karma-Kargyu seat in Sikkim. After the Dalai Lama passes away, UTD would become more free in the Tibetan Buddhism affairs. The Karma-Kargyus are a very important Tibetan sect, perhaps the richest. Without the 14th Dalai Lama, the Gelugpas will be weakened. There is no certainty about a 15th Dalai Lama. Even if there is, he will take years to mature into the unquestioned leader. The Chinese could bring the war inside India and create pro-China monasteries along the Indo-Himalayan belt. The scenario is not a fantasy. It is time that UTD clearly demonstrated his position on Tibetans and the Tibet question. His road to the Rumtek seat is still not clear. His allegiance to the Dalai Lama and the Tibet issue is still to be tested.